Hello Everyone, my name is Felipe De la Rosa. I was born and raised in Queens New York, USA. I came to this beautiful island at the age of 13. I have a degree in law from the prestigious University Autonomous of Santo Domingo (UASD). I love it out here the weather, the beaches, the people, its amazing you feel like you are in a true paradise. My Favorite hobby Is going to the beach, especially the ones in Bavaro, Punta Cana... I Love it! Felipe with both Buyers and International Real Estate Partners. Join us! My mom and I were on the search of an investment property in Punta Cana and Natalia and Felipe were exceptional every step of the way. They are absolute experts when it comes to location and finding the best options within our price range. Not only were they super helpful and efficient during the buying process, but even after the purchase they have went above and beyond the call of duty. When we arrived for the closing of our property they picked us up from the airport and spent the entire week taking us around furniture shopping, setting up all of our utilities, etc. We have now purchased a second property, this time pre construction in Cana Pearl as we are so impressed with the level of service and expertise of this extraordinary team. Thank you so much for everything you have done for us and we will happily refer you to all of our friends and family!!! I have purchased a condo in cana rock and Felipe was great best realtor in DR hands down! Very professional always, when i had questions and needed information he always was a phone call away . Felipe helped me get a great deal on my property and helped me negotiated the price . Great realtor and also now a great friend ! Happy to have delt with him highly recommend him for any of you real estate needs . We had an awesome time with Felipe at Cana Rock as we found a great investment opportunity and vacation get away. Thanks Felipe!!!! My husband and I have wanted to purchase a vacation home in Punta Cana for some time now, but were scared of being scammed.. ( we've hears horror stories) but after browsing through REMAX Tropical's website and reading all the great reviews, we decided to give them a Try. We were on family vacation in Punta Cana so I called Felipe on a Sunday afternoon, and with in half an hour he was picking us up at our hotel. I cannot tell you how happy we are that we found Felipe. He is very professional and took the time to answer any questions and concerns we had.. He made us feel confident in purchasing our dream vacation home in Punta Cana. Call Felipe at REMAX Tropical, you will not regret it.. If you are looking for a place in the Dominican republic, this is the place to call. Felipe and the entire staff of RE/MAX Tropical are so helpful and professional. My wife and I purchased a condo in Cana Rock Star at the Hard Rock after looking at several options. If you are serious about finding a place in the DR, call them! For a while, I had been exploring making a real investment in Punta Cana and eventually called DR4 Sale. Felipe and Natalia steered me in a direction that got me quite excited, and I made a visit to the country this week. Well, my expectations were totally exceeded. Not only did they expose me to what appears to be a real great opportunity, but they managed the process in a most professional way and made me feel welcome and relaxed. 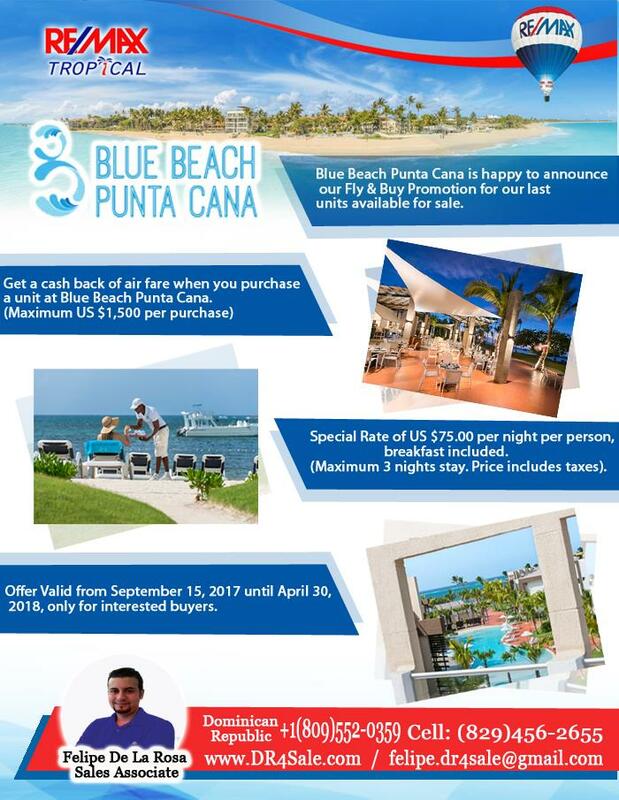 Their confidence in their product transferred to me and I left Punta Cana fully trusting this company to reliably take care of the buying process. I would not hesitate to recommend this company, and Felipe and Natalia in particular, to anyone who is exploring a real estate opportunity in Punta Cana. While vacationing in Punta Cana my husband and I were looking at real estate for a rental property. We do have a condo rental in Florida and thought it might be nice to have one in DR. I text Felipe and he IMMEDIATELY text me back! He arranged to pick us up the next morning and took us to look at plans for Cana Rock! We were quickly impressed but still unsure as no model had been built yet! We saw the plot and artist rendering and loved what we saw! Our condo is due to be finished in 2019 ! Yes we bought and what a wonderful purchase we have made! We are in our 60s and have bought many homes and rental and Felipe has been the BEST, most HONEST, SINCERE person we have EVER worked with!!! He has become part of our family and look forward to seeing him on our multiple trips to Punta Cana! He made this the easiest process we have ever had as far as purchasing!! He has kept us updated regularly on the building process! THANK YOU FELIPE! We are truly blessed!